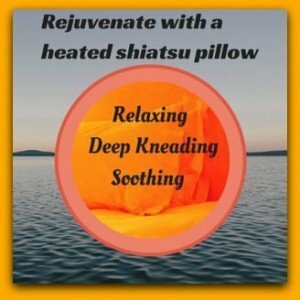 Relax with a deep kneading shiatsu massage pillow with heat for neck, shoulders and back relief. This Zyllion ZMA-13-BK shiatsu and vibration massage pillow with heat works on your tensed and tight muscles, doing a relaxing and soothing circulation kneading. This heated shiatsu massager can be used to massage your neck, upper and lower back, abdomen, thigh or calf areas. Zyllion deep kneading shiatsu massage cushion with heat makes a great housewarming gift for health and relaxation. Offering shiatsu massage with heat to soothe aching muscles as well as improving blood circulation, this Zyllion ZMA-13-BK black Shiatsu Massage Pillow with Heat has a 6-cm ultra slim and compact body. It is very easy to use. Sit back with the ergonomically design shiatsu massaging pillow fitting nicely into the small of your back and neck. Strap the massaging cushion or pillow to your comfortable chair or even the car seat with its fuss-free adjustable strap. The shiatsu massage device comes with charger for home use as well as car adapter for use in the car. Switch on the Zyllion back and neck shiatsu massager with heat function and 4 deep-kneading rotating shiatsu massage nodes. The massager will also auto reverse and continues its deep circular massage in the opposite direction during each session. You do not have to worry about overheating as the machine comes with an overheating protection device and will automatically switch off after 20 minutes. The Zyllion deep kneading shiatsu massage cushion with heat makes a wonderful housewarming gift. Every one loves to feel refreshed and rejuvenated with a good neck and back massage right in the comfort of home.